As creatives, watching our favorite films is a great source of creative inspiration. Some of us are greatly inspired by massive action scenes, stunning visual effects and beautiful cinematography. However, did you ever wonder how an epic setting or a remarkable character was conceptualized? Well, most of them – just like any other forms of visual art – started from a unique idea, later visualized in a sketch and finalized as a concept art. Concept Art today is widely used in movies and other forms of video productions like video games, animations and even in comic books. It is a form of illustration to achieve the goal of conveying a visual representation of a design or idea before it is applied to make a final product. This form of art is also considered as visual development or concept design. The term was early referred to automotive design for concept cars as a part of an animation process. References to the term “concept art” can be traced back to early 1930’s used by Disney Animation. Science fiction and fantasy are the two most covered themes of concept art. Artists generate a visual design of an idea or concept that is not yet existing. Thus, concept art is the backbone of an incredible design product. The most remarkable films from the past to present day will not be that successful if not with the help of amazing concept artists today. Who would not know the amazing concept artworks of the late Ralph McQuarrie for the original Star Wars trilogy, Battlestar Galactica and more? Aside from him, more and more artists have conquered the world of this artistic discipline. And to further understand their contribution to the films you love the most, we here at You The Designer have compiled a few of the most amazing concept artists today together with their concept artworks on some of the most iconic films to date. Enjoy! Los Angeles based artist Nathan Schroeder is working as a professional concept artist in the movie industry. He received his degree in Cinema TV production at the University of Southern California School of Cinema Television and later studied fine art and illustration at the Art Center College of Design in Pasadena, California. He is behind the concept artworks for many films such as X-Men, Indiana Jones and The Kingdom of The Crystal Skull, Star Trek XI, Fantastic Four: The Rise of The Silver Surfer, The Avengers and many more. Working as a freelance concept artist, the works of Josh Nizzi are mostly associated with live action films, video games and comic books. He has worked on projects like Transformers: Revenge of the Fallen, Transformers: Dark of the Moon, Battleship and The Amazing Spider-Man. American-born concept designer Ryan Church is best known on his concept works on vehicles, planets and architectures. His clients as a freelance concept artist includes Paramount Studios, Universal Pictures, Mattel, Sony Pictures, Blue Sky Studios, Bay Films, Lightstorm Entertainment, Walt Disney Animation Studios, Dino de Laurentiis Company, Digital Domain, and Electronic Arts. His works are notably seen on various projects such as Star Trek, Transformers 2, and James Cameron’s Avatar, Transformers 3, Disney’s John Carter, and the upcoming Star Trek sequel (2013). Southern California native – Dylan Cole is an art director, concept artist, and matte painter who specializes in film, video games, and commercials. Dylan studied Fine Arts in UCLA where he continued to draw and paint traditionally. Today, he has contributed concept art art to over 50 films including Avatar, Alice in Wonderland, and Tron Legacy. Award-winning German artist, Michael Kutsche is a self taught artist popular for his works both in traditional drawing and digital media. His works has been described as a lifelike rendering of imaginative and odd characters in various films and comics. His concept art career began with the movie Alice in Wonderland back in 2008 and continued working for John Carter and Thor. NOTE: Images on this page are not owned by YouTheDesigner and are used solely as design examples and inspiration. All images might be subject to copyright by their respective owners. Please click on the link below each image to see their original sources. There you have it guys! 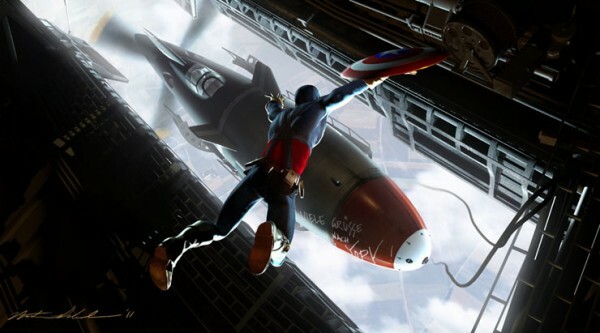 So the next time you see a movie, you might just want to give credits to the amazing concept artists behind them. Do you know other amazing concept artists? Don’t forget to share us your thoughts and suggestions by commenting below. Find us on Facebook, Twitter and Google Plus for more updates, design news and features, or better yet subscribe to our blog for the freshest design inspirations and stories. Stay awesome everyone!